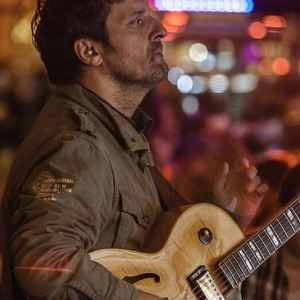 Guitarist, composer and arranger Ante Gelo graduated jazz guitar at the University of Music and Performing Arts in Graz. In 2001 he enrolled in a master’s degree in composition and arranging at the same institution. He has performed in numerous concerts and jazz festivals in Croatia, Hungary, Brazil, Serbia, Austria, Germany, France, Slovenia, and Italy. He also performed in major concert halls of the world: L’Olympia (Paris), The Royal Albert Hall (London), Wiener Konzerthaus (Vienna) and Carnegie Hall (New York). On the Croatian jazz scene worked with Bosko Petrovic, Matija Dedic, Amira Medunjanin, Tamara Obrovac, Harper Lee, Alberto Marsico, Gabi Novak and other well famous musicians. He has also worked with important names of Croatian pop music scene: Oliver, Arsen Dedic, Gabi Novak, Nina Badrić, Tereza Kesovija, Tedi Spalato etc. He mostly works as a studio producer and arranger, writes for numerous orchestras: the Zagreb Philharmonic Orchestra, the Symphony Orchestra, the Zagreb Soloists, the HRT Big Band, Big Band, HGM, The Ljubljana Symphony Orchestra and many others. He has won several Music Awards: “Porin” for the best arrangement, composition, production, Croatian Composers Society Award for best jazz composition, Croatian Music Union Award “Status” etc. He is also active as a jazz educator at various Croatian Musical Youth jazz workshops, at University of Rijeka jazz seminars and Jazzinzy seminar in Novo Mesto.